It is a small, picturesque colonial town with broad cultural offerings. I had the good fortune to live in San Miguel de Allende for a half year when I was a child and to revisit the town in my adulthood. So I have seen it change, transforming from a quiet into a somewhat touristy town. 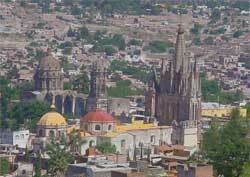 Still, it has retained its Mexican charm, aura, and colonial architectural purity. The town has a quality reputation for its restaurants, art galleries and craft shops. It also is a center for art, music, cooking and language schools. It is the pink-toned La Parroquia (Parish Chuch) on the main plaza. Its facade and twin spires are "bastardized" Gothic, but nonetheless enchanting. In 1880, the local architect relied on picture postcards of European Gothic cathedrals as his muse when he restored the church.